Nuvo Garage made the process so easy for us, not only arranging for specialized concrete and also organizing all of our lawn and garden tool and materials. Our once unusable and ugly garage had been transformed into a practical, tidy and safe workspace. It is now a pleasure to be in there. 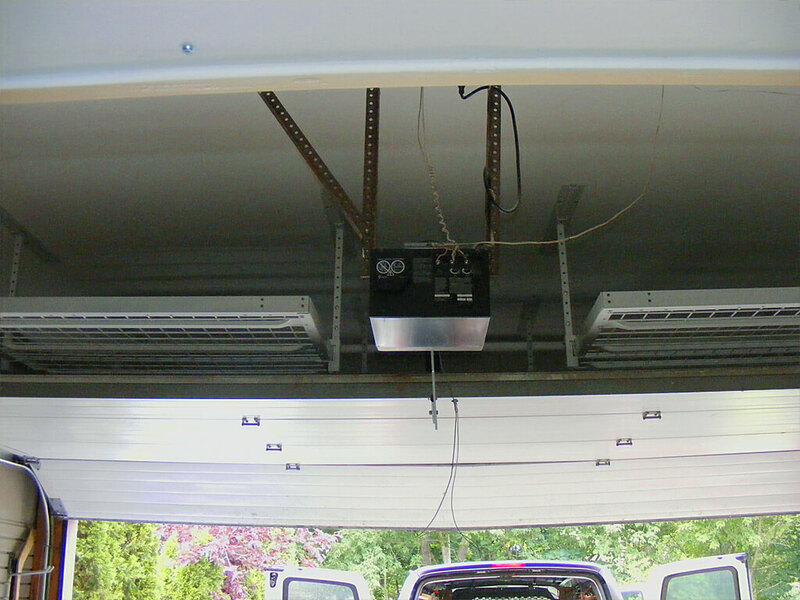 Not every garage remodel needs to be a huge project. 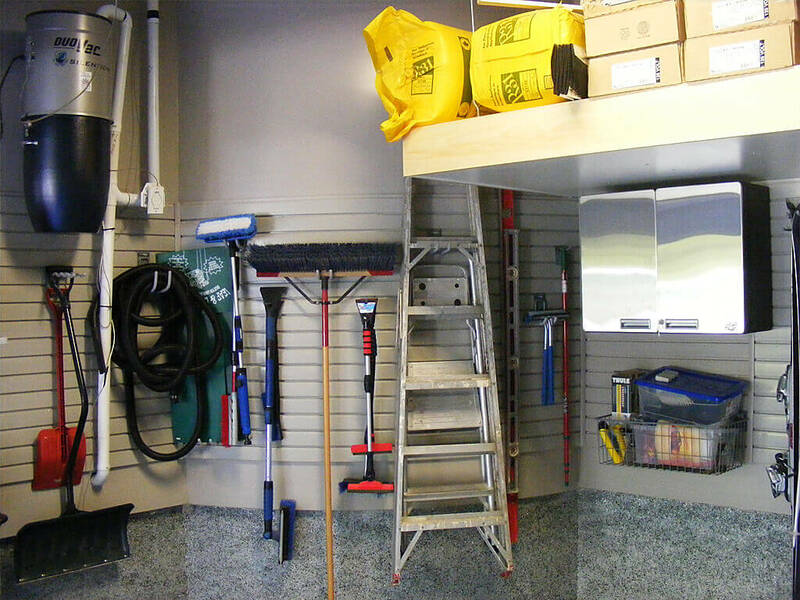 The most effective storage solutions offer you a straightforward way to easily access and find tools, supplies or equipment. Sometimes minimal solutions are the most efficient. That’s the situation I encountered with a family that included an avid gardener in a High Park garage design & renovation. 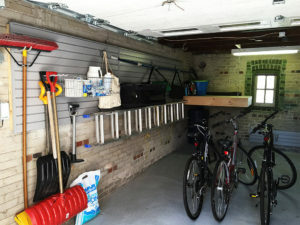 The outdoor-lover in the family used the garage to store most of his gardening supplies. However, there were virtually no storage solutions used at all, and everything was just haphazardly strewn about it. It not only made it difficult to find things and work in the space, but it was also dangerous because gardening tools were just lying on the ground. The workbench was unusable because it was storing supplies and tools as well. This client also needed some serious work done on the floor of the garage. The concrete flooring was heavily pitted and uneven. It had large cracks that made me question its integrity. For safety and to increase the overall cosmetics of the garage, we ended up completely removing and replacing the floor so this wouldn’t happen again. A slatwall installation made storage of various gardening tools easy. Hooks, baskets and shelves worked well to arrange tools and supplies, so items were effortless to locate and painless to access. Using CamLok technology, even the heavy lawn mower had a handy place up off the floor to create more workspace. The design included a floating potting bench so tires could be stored underneath the bench. 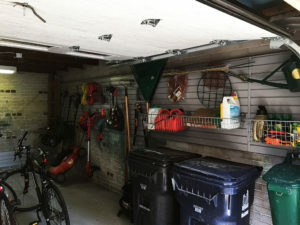 With the new design, the gardener in the family could do his potting in the garage instead of attempting to find space outside or risking a limb to get back to the old, unsteady workbench that was previously in the back of the garage. The floating potting bench also freed up the back wall to integrate more storage solutions in the future as well. Incorporating a wall organizational system gave our garden-loving family in High Park more space than they knew what to do with. The garage now had so much additional space that the trash and recycling could sit in the garage as well, keeping it away from the wind and critters. 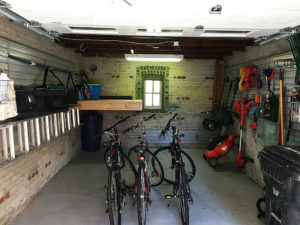 They could now also store their three bicycles in the garage without fear of getting them stuck in the clutter or walking on a gardening tool. Even with the complete floor replacement, we completed the project in less than a week. 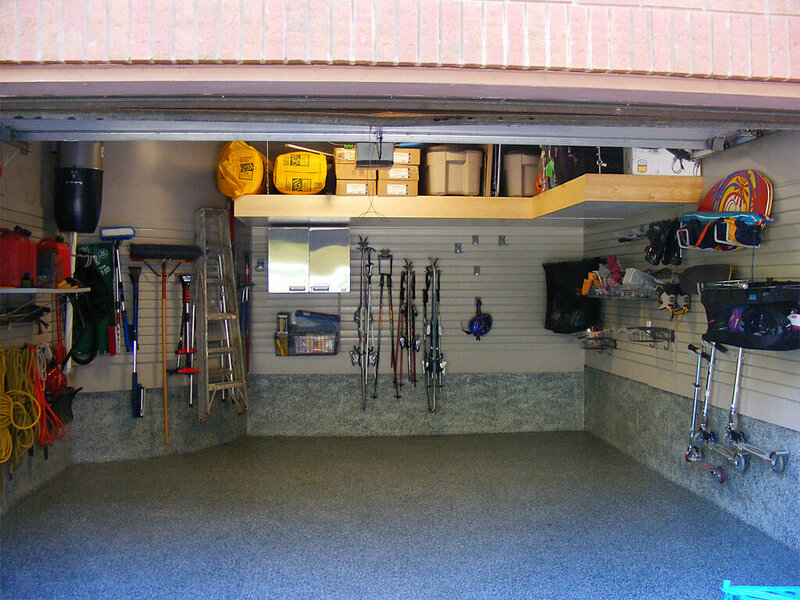 Wall storage, a custom-built working area, and new flooring turned this cluttered garage into a clean, organized and workable space.